The History Blog » Blog Archive » The aquila has landed! The flight was terrible, as they always are these days, and departure was delayed over an hour, but it was all forgotten upon landing. (Okay, upon getting through security.) Sun and blue sky and Father Tiber welcomed me in their warm embrace and I hit the streets as soon as I dropped my crap off at the hotel. A quick jaunt to St. Peter’s where I hoped to catch the Pope canonizing some saintly types but alas, didn’t quite make it on time. That’s cool, though. I got to hear the Vatican band play the Italian national anthem and enjoyed the jaw-dropping view of how freaking clean the colonnade and facade of the basilica are. It never once looked anything near that ideal off-white when I lived there. And the fountains in St. Peter’s Square! In my day, whatever parts weren’t black as coal on them were coated in green algae slime. Not anymore. All that gunk has been replaced by pure travertine creaminess. 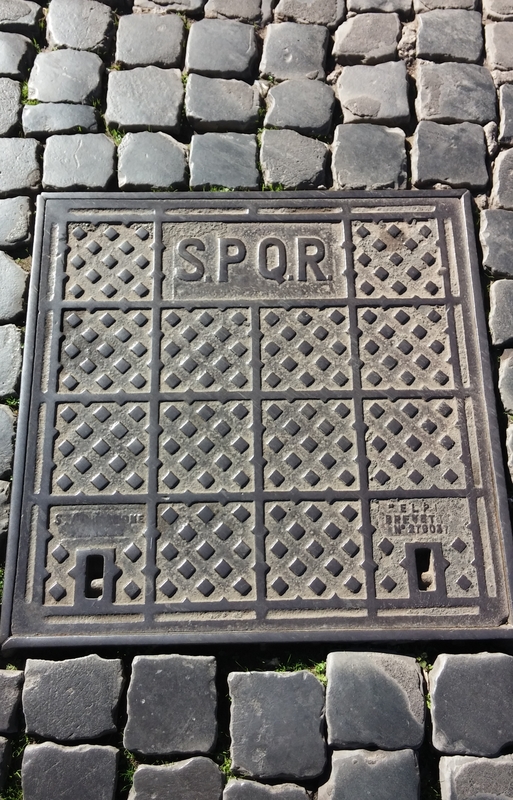 Sono Pazzi Questi Romani manhole cover with original sampietrini basalt pavers. Murder on the shoes and just plain murder when they’re wet, but they are so quintessentially Rome. They’re gradually replaced with terrible modern replacements everywhere except on small streets and in the historic center to preserve its character. Just a charming little fountain at the end of a street near the Tiber. It’s drooling more than fountaining these days on account of water restrictions. 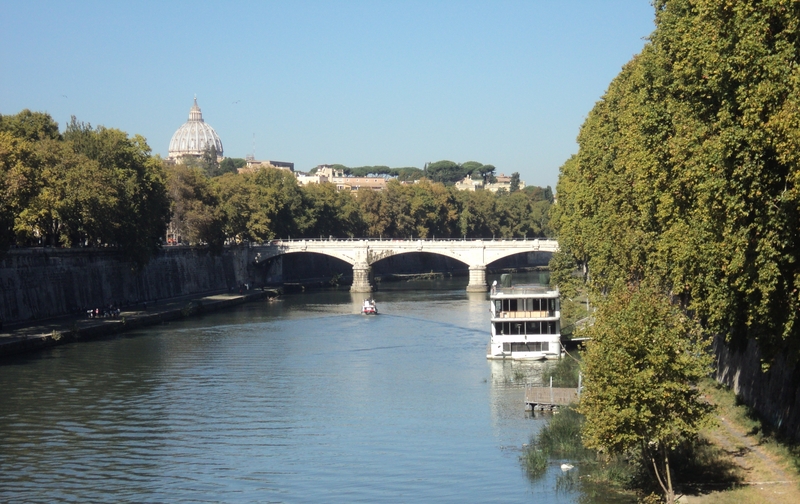 I crossed the Tiber on the Ponte Sisto and saw this in the distance. Makes it easy not to get lost even after so much time has passed. 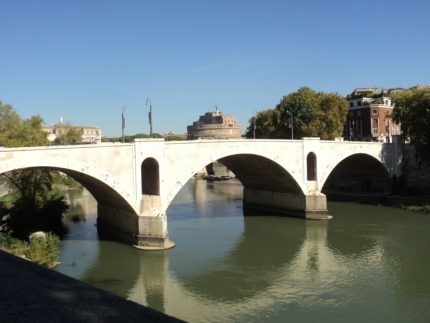 I didn’t cross over to see the Castel Sant’Angelo up close and personal due to my hustling to get to St. Pete’s. Maybe I’ll go back to see it lit up tonight. And here we are. So bright and creamy in the sunlight. The banners you see hanging from the church balcony celebrate the new saints, Capuchin friar Angelo d’Acri (d. 1739); Manuel Míguez González, founder of the Daughters of the Divine Shepherdess (d. 1925); the 30 “Matryrs of Natal” who were killed by Dutch troops and their local allies under the direction of radical Calvinist Antonio Paraopaba in Natal, Brazil, in 1645; and the “Child Martyrs of Tlaxcala,” three indigenous Mexican 12- and 13-year-olds who were killed in the late 1520s (the Franciscan advance guard evangelizers only got there in 1524) for refusing to renounce their Catholicism. This entry was posted on Sunday, October 15th, 2017 at 11:18 AM	and is filed under Ex Cathedra, Roma, Caput Mundi. You can follow any responses to this entry through the RSS 2.0 feed. You can skip to the end and leave a response. Pinging is currently not allowed. Very cool! Thanks for sharing – and show us more…. Cool pics! Glad you got there safely. Will be checking every day for new photos. Thanks for sharing your travel photos. I look forward to seeing more. Have a safe and enjoyable trip! What the INTESTINES for today did reveal: You are making … HISTORY ! Is that manhole cover actually original? Or is it newer? There is a patent number, and my own personal guess would be ’20th century’. i spent a college semester in Rome for a study abroad in the 1990’s. 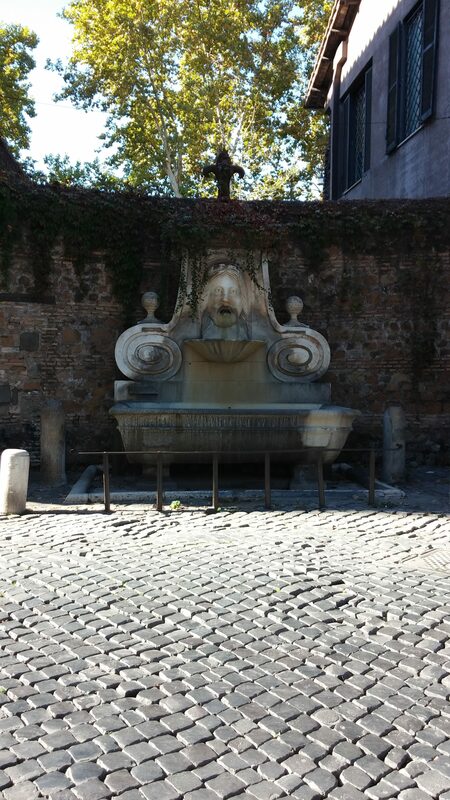 Rome had only 6 American universities programs and mine was the largest at 200 students. at the other end of the spectrum, Florence had 22 American universities. that’s a lot of ameican colleges for such a small town. Florence is literally an American college town with thousands of American college students everywhere, something that is lost on most tourists staring at the Duomo. regardless, italy is great. i’m a bit envious you are there and i am not. keep up the great work on the blog. I am very happy that you were finally able to book your Perillo Italy Tours. 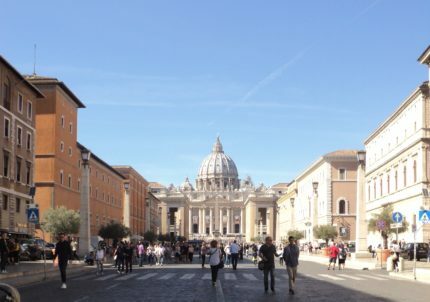 I was in Rome over the weekend and was also really surprised to see St.Peter’s looking so fresh! And am glad to report the fountains were still goo-free as well. I even managed to get an unplanned glimpse of the man himself. Just happened to be there on Sunday and after the shock of seeing the ridiculously huge crowd trying to enter the square and joining the line/misshapen crowd-formation for what we expected to be at least a two-hour long wait to reach the entrance of St.Peter’s, everyone started cheering and there was Papa Francesco standing at his window waving. And when he left, so did most of the crowd and we were in St. Peter’s in no time at all!